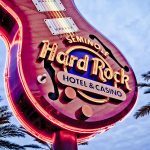 Texas Hold’em and Mississippi Stud are two very different games, but with over 120 table games and 50 traditional poker tables at the Seminole Hard Rock Hotel & Casino Tampa, we figured it would only be appropriate to share the rules on how to play in the big games. One of the biggest differences between the two games is when playing traditional Texas Hold’em, you’re playing against all of the players on the entire table, but when playing Mississippi Stud you’re playing against the dealer. Texas Hold’em is one of the most popular traditional poker games today…one of the reasons is that “any two cards can win.” The same holds true for the new table game Texas Hold’em Bonus Poker, which is where players play against the dealer not against each other. In either game, the best “hole cards” (2-card starting hand) sometimes will not win and the worst starting hand (hole cards) sometimes become the winning poker hand after all of the community cards are exposed. Two cards are dealt to each player; Two cards to the dealer and Five Community Cards are dealt face-up in the center for both Players and Dealer to use in any combination (3,4 or all of the 5 Community Cards may be used) to make the highest ranked poker hand. 3-cards– 3-Community cards are now placed “face-up” on the table. Players now have the option to not bet or bet equal to the Ante. Turn– A 4th Community Card is turned face-up on the table. Players now have the option to not bet or bet equal to the Ante. Each player uses his/her 2-card hand along with 3, 4, or all of the 5-Community cards to make the best poker hand. * Optional side-bet Bonus wager plays against a posted pay table (not the dealer hand). When a Player wins, the Player retains his/her Ante and is paid even money on the Flop + Turn + River wagers. When a Player’s winning hand is a “Flush” or greater, the Ante + Flop + Turn + River wagers are paid even money. All poker-ranked hands of equal value between the Player and the Dealer will be considered a “tie” or “push” whereas no money will be collected or paid. Players who have made an Ante Wager have the option to make a Bonus Jackpot wager. Bonus Jackpot wagers are paid no matter who wins the hand (Player or Dealer). Mississippi Stud is a five-card poker game that lets you bet up to 10 units on a single hand. In Mississippi Stud, you compete against a paytable, not against the dealer, and you win if your hand is a pair of Jacks or better (pairs of 6s-10s push). The top payout is 500 to 1 for Royal Flush- and it pays on all bets. At this point, you may either fold or make the 3rd street bet of 1x to 3x your Ante. The dealer then reveals the first community card. Once you see the first community card, you have a choice: fold or make the 4th street bet to 1x to 3x your Ante. The dealer then reveals the second community card. Once again, you can fold or stay in the game by making the 5th street bet from 1x to 3x your Ante. After the dealer turns over the final community card, he resolves all wagers left in action. You win if your five-card hand is a pair of jacks or better (pairs of 6s-10s push). See paytable for odds.